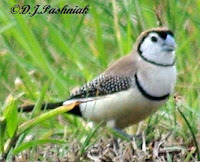 This beautifully patterned little bird was hunting around in the grass beside the bay the other day. I had good clear views - but it certainly wouldn't let me get any closer. Double-barred Finches have a most distinctive call - they sound rather like a tiny mewing kitten. 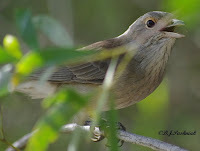 I have also heard these birds around my house but I think they are using the more dense shrubs in the neighbour's yard. This was the second day out kayaking for me after a long break and once again the weather did not cooperate. The rain absolutely pelted down and I could only get the camera out during the brief period between showers. Then of course, once I was home again, it all cleared up and we had a fine sunny day. I kayaked around to the Mullens roost as there is always a different selection of birds there. I have been told that waders need to increase their body weight by at least one third to make the northern migration successfully. 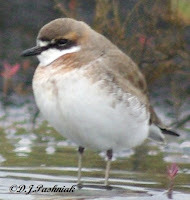 These Lesser Sand-plovers breed in inland eastern Siberia so they have a long way to go. The photos I took yesterday show all the birds looking like little fat balls. 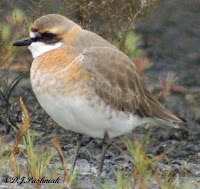 I also managed to get photos showing different stages in breeding plumage. I had a great time kayaking - even if it was raining! Yesterday was a great day - after nearly two months I got out in the kayak again. I paddled to the roost at South Crab Creek to see what shorebirds were still here. There was a little too much wind and the clouds came up and made everything quite dark before I left - but it was great to be out watching the birds like this again! Numbers were well down from the huge numbers I had counted in December. This roost usually has hundreds of Bar-tailed Godwits but by now most of these have left on their northern migration. Some of the ones left are showing no signs of breeding plumage - these are possibly juveniles that will spend the winter here in the southern hemisphere. 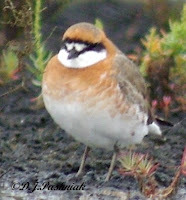 Others were nearly covered with the lovely brick-red breeding plumage on the front. I decided to post this photo taken last season to show breeding color covering the male. The female on the left has not started changing plumage yet. 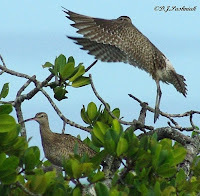 There were a surprising number of Whimbrels roosting in the mangrove trees lining the creek. I can't find records of these numbers this late in the season last year. 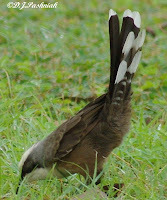 It is almost impossible to see these birds at all until you are so close to them that some at least fly off. Whimbrels don't change color for their breeding plumage but do become darker and more heavily patterned. 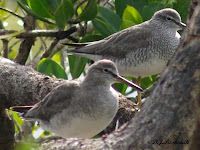 There were small numbers of Grey-tailed Tattlers also roosting in mangrove trees. I noticed last year that these birds leave quite late in the season. Some were showing quite heavy breeding pattern on their fronts. 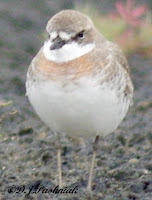 I also saw small numbers of Eastern Curlew, and Pacific Golden Plovers, and of course lots of Red-capped Plovers. These last are here all year round. Yesterday afternoon was a very low tide so I went out to Inskip Point and walked out onto the sand flats to see how much of the sand island was left. Quite a lot of sand has gone from what used to be the highest parts of the island and it looks as if it will only come out of the water on the lower tides. However, I have since been told that this has happened before and it has always built up again. I hope so! and one of the barges that takes cars over to Fraser island. Fraser Island is in the background. There was a small flock of terns roosting out on the edge of the sand and as I went closer I saw one bird that didn't fit in. I walked very slowly closer and the terns did not disturb but the strange black bird did! However, I managed some distant photos - enough to give me an ID. 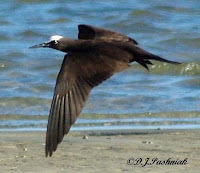 It was a Noddy - I think a juvenile Black (or White-capped) Noddy (Anous minutus). These birds are from the tropics and seldom get down this far. Sometimes big storms blow them down here - so I guess cyclone Hamish did one interesting thing for me! The first photo is of the Noddy and a juvenile Crested Tern. Watching the waves and what the cyclone has done is interesting but much more important is finding out what has happened to the birds in the wild weather. I have not yet been able to get out to the roosts at Mullens or Crab Creek but yesterday at Inskip Point I had a chance to see the shorebirds that usually roost out there. The surprising thing was that the sand island out from the Point where they usually roost was totally under water. Instead the birds were packed closely along the narrow strip of sand still exposed right at the Point. Much of the sand was densely packed with birds. 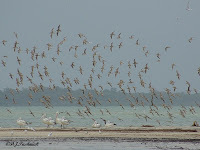 This photo shows part of the flock which in this area was mainly Godwits. I have left the photo very large to show how close the birds were standing. The tide was going out so some – especially the smaller ones - had started moving down onto exposed sand to feed. While I was there a couple of four wheel drive vehicles drove a little way along the sand and people got out to fish. This disturbed the birds and many of them flew up – but then settled down again as there really wasn't anywhere else to go. There are Pelicans in this photo still standing on the sand so not all have gone inland to breed yet. 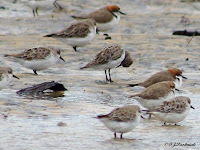 The photo below shows Caspian, Crested, and Little Terns; a Pied Oystercatcher, and Bar-tailed Godwits – some of which are going into breeding plumage – a lovely brick-red color. Many of the Little Terns were also showing some breeding colors. 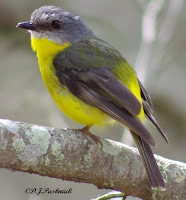 In non-breeding plumage the feet and bill are both dark but in breeding colors the bill is yellow with a dark tip and the feet are also yellow. This one has not yet got all the black on its cap. There were also large flocks of Red-capped Plovers, Lesser Sand Plovers, Red-necked Stint and some Double-banded Plovers back here after breeding in New Zealand this summer. Some of the Red-necked Stint were also showing a little bit of breeding color in the plumage although not as much as later in the season. Back at the car park this Mistletoebird was sitting up in one of the trees. I have never seen a Mistletoebird all fluffed up like this – and certainly they are not pictured like this in any of my bird books! I went over to Rainbow Beach this morning. The sea was very rough and the surf was dark with the sand that was being dragged off the beach. Cyclone Hamish is still making its presence felt! Looking south toward Double Island Point. Looking north toward Fraser Island. out on the waves. Not my idea of a good surf but he was enjoying himself. For the last few days I have been waiting to see if Cyclone Hamish - a category 5 storm - would pass by out to sea or cross the land somewhere close. By Sunday evening heavy clouds were building to the north. From then onwards the wind picked up and there was driving rain. It certainly has not been weather to go out in and risk getting my camera wet! However, by yesterday the cyclone was passing further down the coast well out to sea and was being downgraded. Today it is even further out to sea and listed as a category 2 storm. The wind is dropping and the rain is not as heavy and only intermittent. The tides over the last few days have been listed as the highest for the month but this morning I went down to Tin Can Bay foreshore to look for myself. The storm has pushed in extra water and the tides are much higher than expected. We had huge tides in January but even though the ones this month were listed as being 200mm lower, this morning's tide was actually higher than those in January. I sat in the car, turned out of the wind and lowered one window to take photos and stay dry. The road out to Norman Point was close to being covered with water. Norman Point looking back towards Tin Can Bay. At Crab Creek the rain briefly stopped so I got out with a rain coat on and my camera clutched under one arm and under my coat. 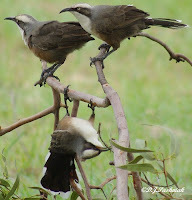 These Grey-crowned Babblers were busily pecking at food on the ground. I have never seen this bird around here before and would have like to get a few more photos but the rain was starting again. Was this a game to hang up-side down - or just a way to search for insects under the branch? I always enjoy watching birds and yesterday it was even more interesting. I was watching this little bird but I am sure it was also watching me. It flew into some bushes beside me and I stood still and hoped for a chance to photograph it without the leaves and branches in front of it. Then it flew a little distance and this time had a larger branch just beside it - and finally flew again to where it was almost directly facing me. All the time it was moving its head around as though getting a view of me from different angles. It was a new bird for me - I am still struggling with all these little bush birds! 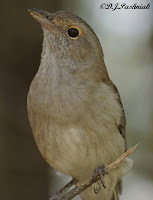 It was so close that I was sure it would be easy to get an ID from the photos, but when I looked in my bird book there was nothing that looked exactly like it. 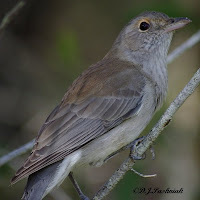 I consulted some much more knowledgeable friends and they got out ALL their bird books before coming up with an ID of a juvenile [correction - it should be 'immature'] female Grey Shrike-thrush. So now I need to see adults before I can be sure that I will recognize this species again. I am including the first photo behind the leaves and twigs - a different 'pose' from the others. By the way - this was out at Inskip Point again and I will include a photo taken from the edge of the bush and looking across the channel to Fraser Island. This place is beautiful! I have seen these little birds in a number of different places around my area but, again, the best views I have had have been out at Inskip Point. The bush track out to the point has a great variety of birds sheltering in the trees and bushes. This photo was taken out there.